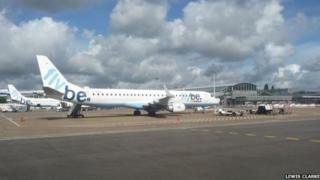 Planes in and out of Southampton Airport have been disrupted because of air traffic controller illness. Flights had to be halted for three 30-minute periods so staff in the control tower could comply with rest breaks despite the shortages. One passenger complained his plane was delayed by 90 minutes. The National Air Traffic Services (Nats) apologised for the inconvenience but warned there would be a similar situation on Sunday. Nats said "staff sickness" had caused the issues in Southampton's air traffic control tower. A Nats spokesman added: "To ensure we complied fully with the safety regulations around controller rest breaks, this resulted in a stop to inbound and outbound flights for three short periods of time." Brian Fearn, who is travelling to Malaga, said: "[There are] 150 very frustrated hot and bothered passengers on Flybe destined for Malaga are still on the ground 1.5 hours after scheduled departure with no news when we can get off or get away." The Nats spokesman said: "We worked with the airport to ensure we kept the disruption to a minimum."